Crate style furniture that will make you go wow! Facility managers and housing directors have been making an old trend new again. When looking for quality furniture that is durable and budget-friendly, many buyers have discovered that crate furniture has re-emerged as an industry must-have. Solid as a rock, crate style seating and lounge furniture has stood the test of time as a tried and true workhorse that delivers beauty and comfort. If the beauty and comfort part has you scratching your head, consider that the contract furniture industry has at its disposal the emerging technologies of more comfortable foams as well as fabrics that are as well designed as any runway-ready designer dress. So yes, crate furniture is more beautiful and more comfortable than ever! So why has crate furniture been such a well-kept secret? Truth is that trends in furniture, like everything else, ebb and flow based on popular culture, color and style trends. 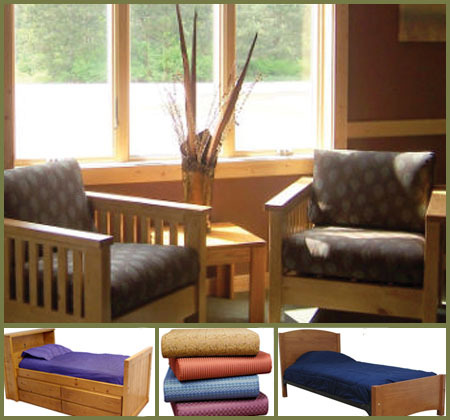 The basics of a sturdy, wood frame is as classic as a little black dress but the increased variety of fabrics, finishes and comfort enhancements has made the classic crate style reemerge as a contender in high-end facility design. All in all, crate style furniture offers the durability, design and flexibility that makes group living and dormitory housing buyers flush with satisfaction. So what can we expect from crate style furniture in 2018? Crate style lounge seating will follow the same trends as the rest of the contract furniture industry and will boast both natural and dark wood tones set off by bright, bold fabrics. Black i s the new grey. Classic Navy combined with greens. Turquoise is still going strong, but brighter. As trends change, crate furniture has the added benefit of easily changeable replacements cushions that are cost effective and design friendly. The solid, hardy frames will last for years beyond typical fully-upholstered seating so replacing cushions is one of the most budget-friendly ways to keep pace with whatever color, pattern or texture is en vogue. Always work with a reputable contract furniture supplier who understands the needs of your facility and can help make the right recommendations for your consumers. The right advice makes the difference in creating the right look and the right function at the right price.